As part of Scalarama, a nationwide festival of cinema, we are showing Daisies. 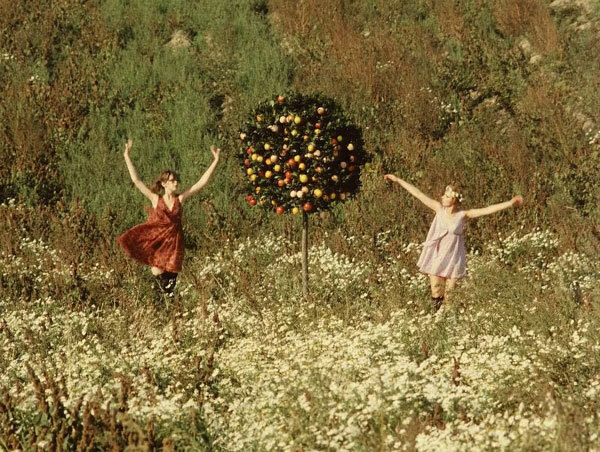 A satirical, wild and irreverent story of rebellion, Věra Chytilová’s classic of surrealist cinema, Daisies, is perhaps the most adventurous and anarchic movie of the 1960s. A riotous, punk-rock poem of a film that is both hilarious and mind-warpingly innovative, Daisies continues to provoke, stimulate and entertain. A satirical, wild and irreverent story of rebellion, Věra Chytilová’s classic of surrealist cinema, Daisies, is perhaps the most adventurous and anarchic Czech movie of the 1960s. Two young women, both named Marie, revolt against a degenerate, decayed and oppressive society, attacking symbols of wealth and bourgeois culture. Defiant feminist statement? Nihilistic, avant-garde comedy? It remains a cinematic enigma and its influence is still felt today – from the extreme ‘Baise-Moi’ to the mainstream ‘Thelma & Louise’ and in the films of (amongst others) Jacques Rivette, Bertrand Blier, Catherine Breillat and Gregg Araki. A riotous, punk-rock poem of a film that is both hilarious and mind-warpingly innovative, Daisies continues to provoke, stimulate and entertain.